The biggest cities in the Republic of the Congo are Brazzaville, Pointe-Noire, and Dolisie. 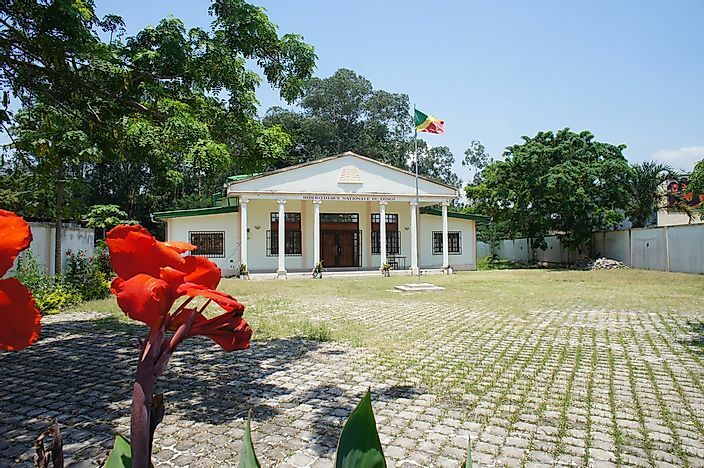 The National Library of the Republic of the Congo in Brazzaville. On the outskirts of the wild African jungle, the urban centers of Brazzaville and Pointe-Noire embody two strikingly different examples of civilization in the Republic of the Congo, deep in the heart of what was once referred to as French Africa. Point-Noire is a coastal boom town, rich with oil money and teeming with ex-patriots from every corner of the globe. Brazzaville, on the other hand, is a classic central African city, with ornate stone churches and a thriving artistic community. Both cities have a unique Francophone flavor, and are currently growing at an impressive rate. Brazzaville has a population of over 1.8 million, and is home to over one third of the country’s citizens. The port city of Pointe-Noire is second-largest, with a population of 715,334. Other notable urban centers include the railway towns of Dolisie, Madingou, and Nkayi, the commune of Ouesso, and the communities of Impfondo, Kindamba, Owanda and Sibiti. Brazzaville is the financial and administrative capital of the Republic of the Congo, and roughly 40% of the country's non-agricultural industrial employment is located here. Local industries include machine shops, textiles, tanning, and manufacturing. A key railway stop and port on the Congo River, huge quantities of raw materials such as rubber, wood and agricultural products are moved through the city each day. Situated on a headland on the Atlantic coast, Pointe-Noire is the main commercial center of the Republic of Congo and a shipping hub for the country’s oil industry. The city is also known for its thriving fishing industry. Dolisie, Madingou and Nkay are major rail centers on the Congo-Ocean railway, running from Brazzaville to Pointe-Noire. Dolisie exports wood and lumber, while Nkayi is a major sugar producer. The country is also on its way to becoming a popular ecotourism destination. Adventure-seekers from all over the globe are drawn to its pristine forest reserves with their steamy jungles, huge populations of forest elephants and lowland gorillas, and troops of swinging, hooting chimpanzees. Ouesso is known for its proximity to a sizable population of indigenous pygmies. As ecotourism to the area increases, more and more tourists are taking advantage of national transportation and city services. The Republic of Congo is one of the most urbanized countries in Africa, with 70% of its total population living in Brazzaville, Point-Noire, or one of the smaller cities along the Congo-Ocean Railway line. The country’s political stability and large scale oil production have given the Republic of Congo relative prosperity despite its poor infrastructure and public services and widespread corruption. Poverty has worsened in the country over the past thirty years, with rural areas hit especially hard. The region’s turbulent history has left its mark on the Republic of the Congo's major cities. Brazzaville has frequently been a staging ground for wars with neighboring Angola and the Democratic Republic of the Congo, as well as between rebel and government forces during the bloody civil wars of the 1990s. Thousands of civilians died and hundreds of thousands of refugees were forced to flee the city. The current administration faces an uneasy peace and the difficult challenges of stimulating economic recovery, as well as reducing poverty.